This B&H Kit includes the Sound Devices 702T High-Resolution CompactFlash Field Recorder and an ORCA OR-41 audio/mixer bag. With two-track recording at up to 24-bit / 192 kHz resolution, stereo analog and digital I/O, timecode support, and generous device/accessories storage, this kit is ideal for field recording and ENG, as well as TV/film/video production. The detachable handles and strap make this well suited for wearing over the shoulder. 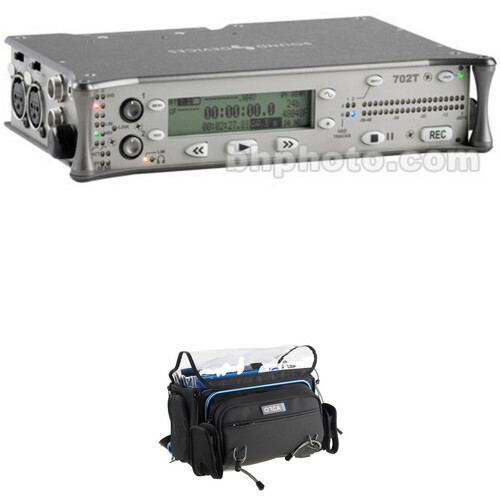 The 702T from Sound Devices is a lightweight professional 2-channel CompactFlash field recorder with time code. It can be used to record and play audio to removable CompactFlash cards and/or external FireWire drives in field recordings and ENG (Electronic News Gathering) applications for sound designers, reporters, producers, and more. Featuring a high-resolution 24-bit/192 kHz recorder, the 702T also supports MP3 file playback, and is equipped with a FireWire port, full AES3 digital recording and playback with dedicated digital metering, dedicated function LED indicators, and comprehensive transport and level controls. The 702T High-Resolution CompactFlash Field Recorder with Time Code includes a carrying case, power supply, 3.5mm-to-1/4" adapter for headphones, 1500mAh lithium-ion rechargeable battery, FireWire power conditioner, and a unit-to-unit linking cable. The OR-41 Audio Bag from ORCA is designed to protect and carry your Zaxcom Nomad/RX-12/Sound Devices 788T and CL-8 units. It features a durable external aluminum frame, an internal honeycomb frame, layers of foam, and EVA.This audio bag can be used in conjunction with the Orca Audio Harness and Orca Audio Waist Belt (sold separately), and a carrying strap is included. Box Dimensions (LxWxH) 16.0 x 10.9 x 5.2"
Box Dimensions (LxWxH) 15.9 x 13.8 x 10.1"